At about 7:40 a.m., Train 774 collided with a tractor trailer truck that was reportedly hauling fertilizer. The tanker truck became stuck on the railroad tracks. There were no reports of any fertilizer spilling. Likewise, there were no reports of any injuries as a result of the collision. 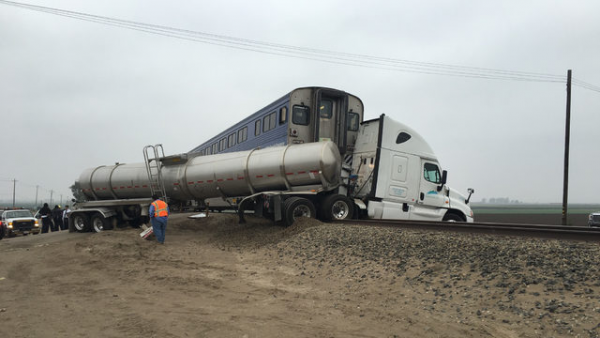 Pacific Surfliner announced the crash is causing lengthy delays and impacting trains to and from San Luis Obispo. Replacement buses are taking passengers from the train involved in the crash to Santa Barbara. This is one of my pet peeves, The train did not crash into the tanker truck, the tanker truck crossed in front of a moving train! This is an example of, “if can happen, it will”.